Black mirror is a popular Netflix original anthological series that examines the dark aspects of modern society with countless casts and stories, from political satires to future dystopias. Despite the vast palette of styles, the show centers around a common theme: technology changes, but people don’t. To relate this to burial and the process of dying, consider season 2, episode 1 of the series. “Be Right Back” begins with one of the most realistic couples the show has featured. Ash and Martha are clearly very much in love. 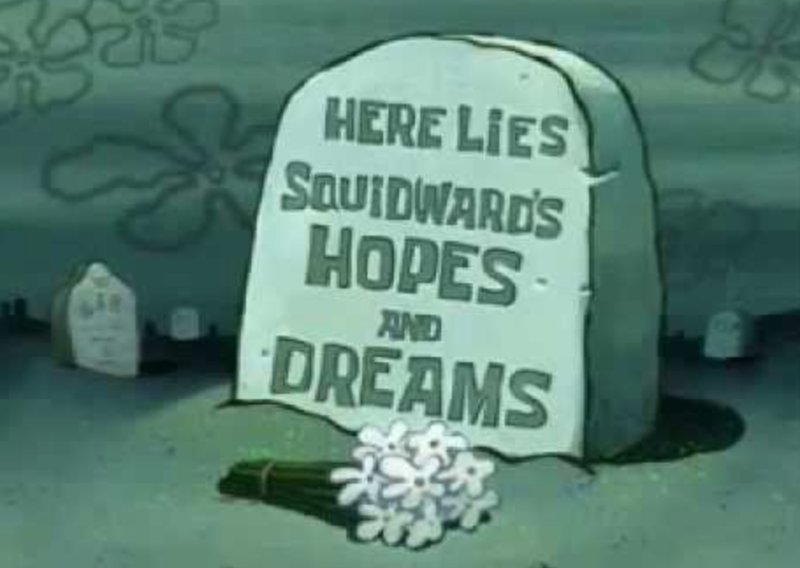 The episode focuses on Martha’s bereavement after Ash’s sudden death. Martha practically sleepwalks through Ash’s funeral until her friend recommends that she try an experimental service that reconnects the living their deceased loved ones. The service uses algorithms to create a memory bot using online data such as photos, videos, and texts written by the person who had passed. This essentially creates a tailored “version” of the deceased loved one. The service offers different levels of interaction. The first is through texting. After trying the service, Martha began to receive texts from this version of Ash, in which the bot simply mimicked Ash’s texting habits and humor. The second is through calling. Martha sent the service samples of Ash’s voice, and the service used them to call Martha as Ash. Finally, the service could create a real life replica of a loved one. The creepiness of the concept is masked by Martha’s grief, and she soon has a walking, talking clone of her dead fiancé. Martha quickly became frustrated with all the subtle but important ways that the android was unlike Ash, particularly in that it was cold, passive, and emotionless. So she locked it in her attic. To Martha, the bot was not quite Ash, but too much like him to let it go. This led to a grief that spanned decades. Surprisingly, Martha’s unhappy ending didn’t dissuade computer scientist Eugenia Kuyda from repeating the experiment. After her best friend, Roman Mazurenko, suddenly passed away, Eugenia was overwhelmed with loss. As she grieved, Eugenia found herself looking through the thousands of text conversations between her and Roman. This inspired her to use the ever improving artificial neural network, allowing artificial intelligence to “learn” as a human brain would, to use Roman’s messages as the basis of a memorial bot. The prototype worked. Roman’s friends and family, (and now the public,) can communicate with the Roman memorial bot. Eugenia and other friends of Roman have said that the responses actually do sound like things that their loved one would say. As soon as the bot was created, Eugenia asked it, “Who’s your best friend?” to which Roman responded, “Don’t show your insecurities.” Immediately, Eugenia thought that it sounded like him. Unlike the Black Mirror episode, Eugenia believes that the memorial bot has helped, rather than hurt, her grief. She likened it to “just sending a message to heaven. For me it’s more about sending a message in a bottle than getting one in return.” The grieving process is different for everyone, and if a memorial bot system was available to the public, it may help many people overcome the deaths of loved ones. Since taking a course on The Philosophy of Religion with Dr. Wendy Farley, I have developed an interest in studying death and suffering. Naturally, I began to pay more attention to how death appeared in every day life and how we (as mortal beings) interact with the idea and consequences of death. The first topic related book I picked up thereafter was The Sacred Art of Dying: How World Religions Understand Death, and I would often read the book behind the coffee shop counter on a slow afternoon. Though it has been two years since I have read the book, I clearly remember author Kenneth Kramer, in his introduction, depicting death in three faces: physical death, psychological death, and spiritual death. Reading about spiritual death inspired me travel abroad to study suffering and Buddhism more closely—but that’s a story for another time. Presently, I contemplate the face of psychological death and its meaning. 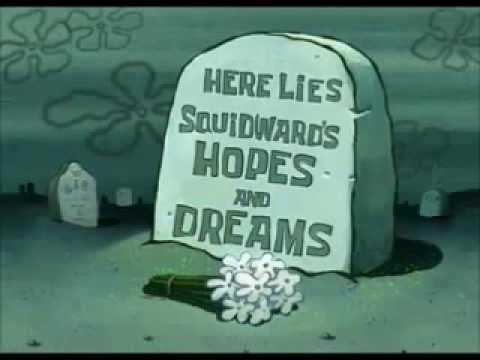 is I wonder if some cases of severe depression can qualify as psychological death. Kramer describes psychological death as a “reversible termination of one’s personal aliveness,” “a kind of emotional death” and “a lessening of aliveness” (Kramer 1988 p.18-19). Say we assume depression is indeed a form of psychological death. Narratives regarding depression and mental health often share stories of numbness, apathy, a lack of will, loss of interest and pleasure in activities, hopelessness and more. These symptoms and experiences of illness fit into the characteristics of psychological death Kramer describes. Suicide ideation could be seen as the desire to experience physical death if perhaps a person already felt psychologically dead. 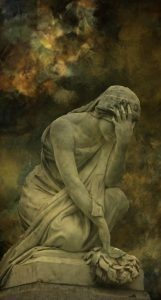 The notion that psychological death is reversible might also speak to the treatable aspect of depression through medications, counseling, psychoanalysis, meditation, and other forms of therapy. I do not know if psychological death is something widely accepted or discussed, but I do think it is an interesting way to frame mental illness. Kramer, K. 1988, The Sacred Art of Dying: How World Religions Understand Death. New York: Paulist Press. A term flaunted in many public circles, political campaigns, and social justice movements. In these instances, “equality” refers to fairness and justice in life; the act of viewing all people without bias or discrimination. Our society is obsessed with rallying behind crusades that foster impartiality in every aspect of life…but what about death? Is there equality in dying? 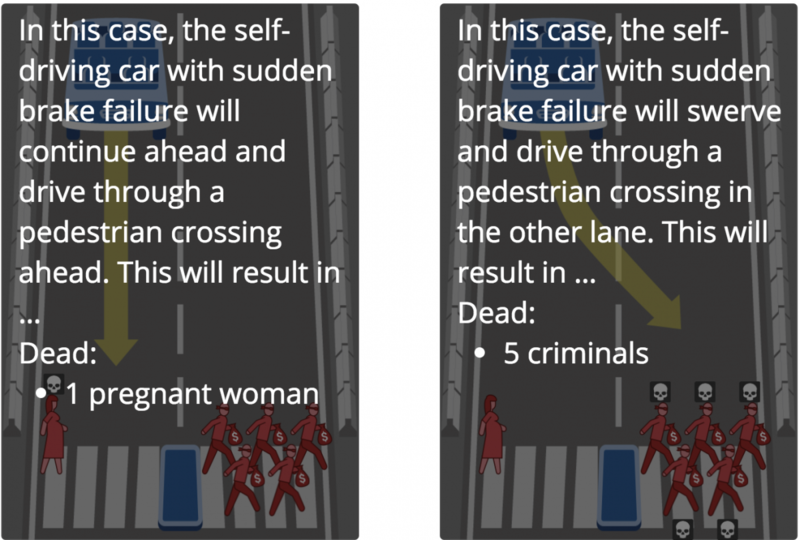 This scenario incites intense debate over what the car should or should not do. 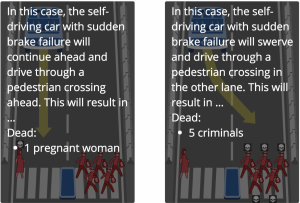 If the car continues in a straight path, one woman and her unborn child will die. However, if the car is programmed to swerve, five people will die. 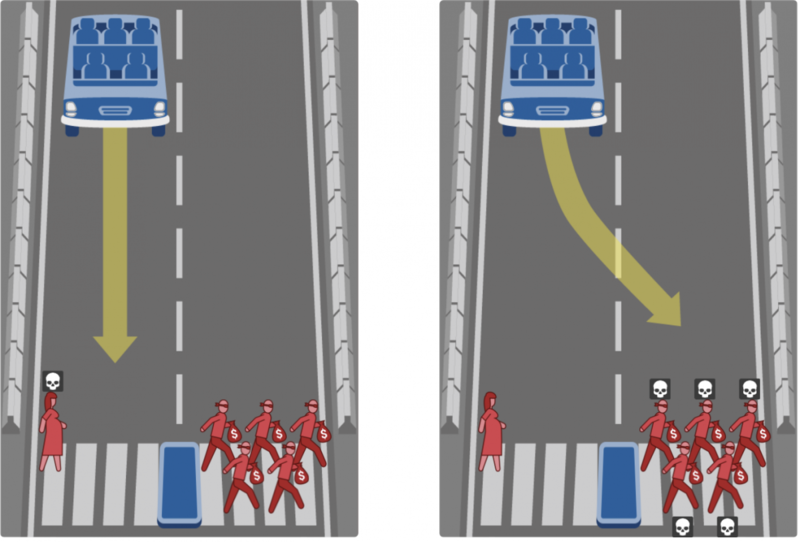 If only provided with the number of deaths, many people would choose to have the car continue straight, saving the most lives. But what happens when we place value on those lives? When the victims are women and children, versus criminals, how do we decide which lives to value more and which deaths to value less? That is the heart of what the Moral Machine aims to uncover. By categorizing people into different groups based on their social value, we assign significance to individual deaths. 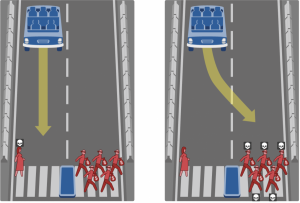 After perceiving the criminals’ role in society, many people may change their minds and program the car to swerve, taking a greater number of lives but saving (arguably) more important or worthy ones. The dilemma in the various circumstances boils down to the modern perception of death and the processes to follow. Our society has cultivated an environment that fights against death. People do not want to die “before their time” and thus are bred to accept death only when they feel that their life is complete or that they have nothing more to give. These personal sentiments are subconsciously broadcast into situations like the self-driving car, where knowing the demographics of a person ranks them on a scale ranging between “worth-saving-at-any-cost” to “not-a-huge-loss.” It sounds gruesome but it’s true. Additionally, our determination of what the car should do originates in the process after a death. We can justify the decision to kill the five criminals if we consider that the pregnant woman and baby would be heavily mourned and grieved whereas the convicts probably would not. Inadvertently, we place values on life and death based on our culture’s view of death and the proceedings to follow. Death and life seem to have an linear relationship; the more we value someone’s life the more we value their death. Is this a true embodiment of equality though? Can equality be extended to the grave? And lastly, what would you do? To see other related scenarios, click here. Those who know me well understand why I was drawn to a title like this. For those who don’t, I have a never ending interest when it comes to dark and unanswered things, such as death. However, this article was not about death. The bigger picture focused on one of my least favorite topics: relationships. As the world becomes, debatably, more progressive, relationship status is not as important, especially in Japan where one was supposed to find a spouse at a young age and start a family. Well, the people of Japan, and society internationally, have decided that a relationship is not a priority. People are living longer and accomplishing more due to the advancement of biomedical technologies which has shifted our values. I know I do not want to get married anytime soon; there is too much for me to see and do in the world-alone. I come from a small town in Maryland where a lot of the girls set out to find a boyfriend in high school, follow him to college, and then get married after graduation. This has happened to a handful of my, high school friends. I am not criticizing them, it is just interesting how societal values can change, but even with international communication, some communities stay the same. Anyways, this is not the case in Japan. More men than women are choosing to stay single for longer or even opt out of marriage and the relationship lifestyle forever. This is great, but unfortunately it takes an eerie turn. Men are dying alone and while that is already sad, their bodies are not discovered right away. It can take up to four months to figure out a tenant is dead. If they are living alone, nobody notices their absence until their neighbors distinguish a foul scent, their mail piles up, or they are behind on rent. Yes, their bodies do begin to decompose into the floor and maggots find their way into the housing. This happens so often that a new industry has opened in the Japanese economy for crews thats specialize in cleaning up after lonely deaths. Landlords can and often do purchase insurance, lonely death insurance, so they will not have to pay much to have the apartment cleaned for a new tenant. Shocking, right? 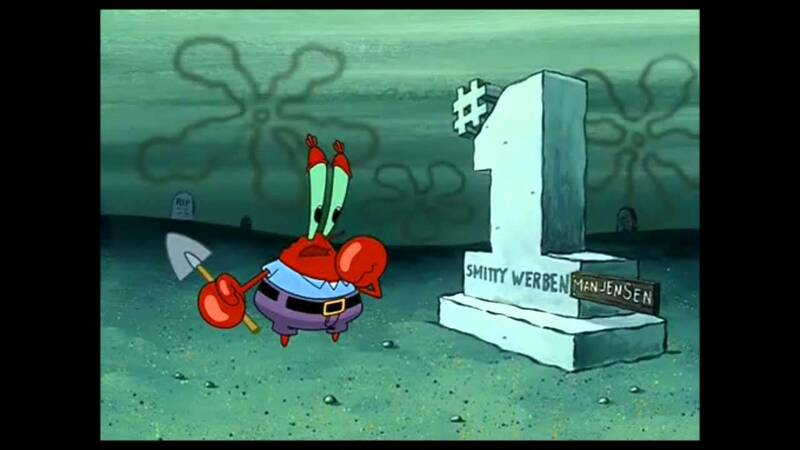 I guess it is good for the economy; it is just sad that when an individual chooses themself over others, they suffer a lonely death where their body sits and decomposes until someone else’s life is affected by the death. Basically, the moral of the story is: find a significant other! I chastised myself for succumbing to click bait, but I marveled at the brilliance of the tactic. This post attracts organ donors like myself because it challenges our beliefs. 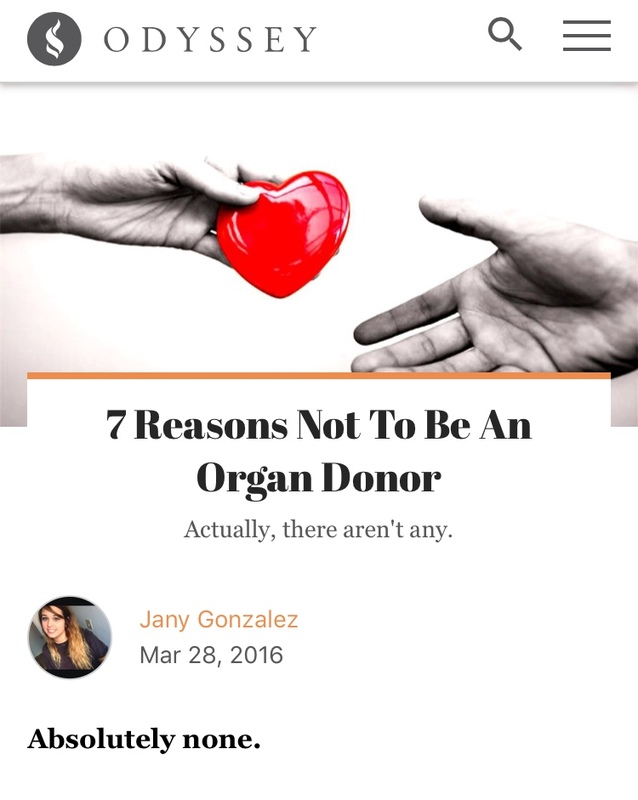 I wanted to know how someone could possibly come up with seven valid reasons for not becoming an organ donor. Yet, it also appeals to those who are not organ donors by validating their decision. The article begins with statistics on the disparity between the number of people who support organ donation and the number of people who demonstrate their support by donating their organs. In the United States, the demand for organs is much greater than the supply. People die every day waiting on the organ transplant list. 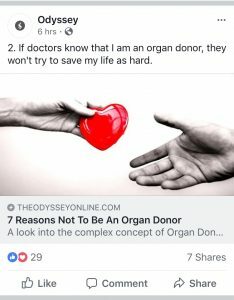 In an attempt to amend these inequalities, the author dispels seven rumors that might persuade one to not become an organ donor. 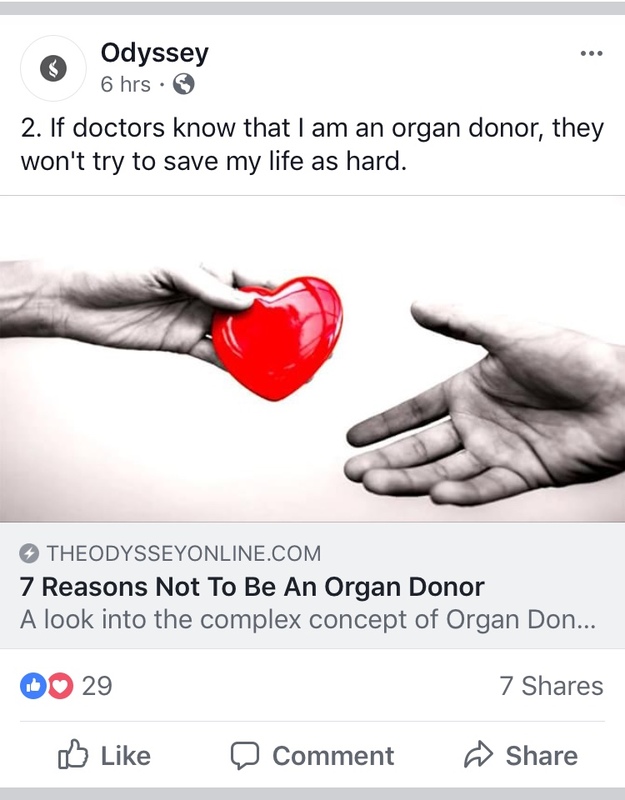 Two rumors addressed in the article were previously discussed in class: “If doctors know that I am an organ donor, they won’t try to save my life as hard” and “Doctors might not be 100 percent sure that I am dead.” These rumors are not unfounded. Instances of supposedly brain dead patients that “wake up” during organ harvesting do exist, like this woman from New York. However, laws and practices are now in place to prevent these gross oversights from happening again. Another common rumor, one that I even believed myself, is that organ donation precludes you from having an open casket funeral. If Americans harbor the misconception that organ donation will interfere with customary funeral practices, I can understand the decision to not become donors. The challenge, nonetheless, will be to educate people on the realities of organ donation. I think this article is an excellent first step in informing the public about organ donation. In this age of technology, many people formulate their opinions from posts such as this one on Facebook. While the argument becomes too emotional at times, it is backed by evidence. To continue learning about other common rumors about organ donation, read the original article here. A phrase from the immensely popular series, A Song of Ice and Fire, valar morghulis is translated as “all men must die,” an idea prevalent in human culture. Humans tend to define many things in duality: light and darkness, positive and negative, life and death. These concepts are thought of to only exist in relation to one another; without light, there can be no darkness. So, can life as we define it exist without the notion of death; in other words, is something that doesn’t die even alive. From the desire to create Philosopher’s Stone, to the search for the Fountain of Youth, to modern stories of vampires, the idea of immortality pervades much of human history. What exactly about the notion is so fascinating? I believe it stems from a fear of death, or the unknown that follows. It is a completely normal fear to have due to the modern world’s obsession with “cheating death.” The idea of living indefinitely seems great, ignoring the looming downsides. These include the loneliness that comes with knowing everything around you is mortal or becoming bored when you’ve seen and done everything. Immortality is rarely depicted as perfect; however, it is still viewed romantically and longed for. However, even if someone doesn’t long for immortality, it seems that almost everyone is afraid of another’s immortality. This can be most readily seen in fiction writing. For example, the demon or such that cannot be killed by normal means (i.e. Voldemort, Dracula). This is typically shown as being achieved through a Faustian deal or something similar. The soul is given up, but the consciousness remains in the body. Is this why the notion is scary? Why are these characters shown as bad for achieving something that is so desired? I really can’t answer this, but it is an interesting double-standard nonetheless. Aside from the fantasy of immortality, the actualization of immortality is becoming not so far off. For better or worse, it may not be humans that will attain this immortal status. Research into AI (artificial intelligence) is moving forward every single day. In my biology classes, we discussed that consciousness is probably not be a single entity, but rather the various regions of the brain all working together (this theory is called the neural correlates of consciousness). This theory is what many researchers in AC (artificial consciousness) are studying; although they must first discover what a consciousness is. But is it possible to synthetically create a consciousness? Is the consciousness equivalent to the soul, is the AC truly alive, can humans use similar technology to extend their existences? These have always been topics in science-fiction, but it may eventually become science-fact. Regardless if an AC is created in a decade, a century, or never, it still remains that we need to redefine life and death. How can we define a living being if it is no longer a requirement that it will eventually die? In my observation of society there has always been an obsession with death. Death is everywhere in pop culture from blazing articles on tabloid pages at the supermarket to brutal deaths being common place on the television screen. Yet as a culture we also seem to have this intense fear of dying. Recently I found myself binge watching Buzzfeed’s Unsolved series, a YouTube series where two men try to prove that ghosts are real or dig into famous mysteries usually pertaining to gruesome, to unsolved deaths. I do not know why I started watching it, but clearly other people are doing the same for their most recent video, posted less than 24-hours ago, has over a million views. While the ghost and demon episodes will often get my heart racing, it is the one’s that explore real unsolved deaths or murders that stick with me. In a completely morbid sense it is compelling. One would think that because we are so open about death and exploring how someone might have died, that the process of dying should not be a taboo topic. But, as soon as death is brought up in the personal sense the discussion ends. Suddenly, it is completely unreasonable to talk about death. A guy’s head being put on a spike on Game of Thrones = fine, but talking about your own opinions surrounding your unavoidable death = over sharing. There are exceptions to this of course. I am very lucky to still have three of my grandparents alive, and recently the topic of dying has been a discussion between my maternal grandparents and me. While at first I was uncomfortable, after taking a deep breath I realized the topic was not morbid at all. In fact, it was in some ways heartwarming. My grandfather described his desire to have his and my grandmother’s ashes mixed and my grandmother told me their plan to meet at “the pearly gates of heaven,” though they have yet to decide on which side of the gate. Here were two people I love with all my heart talking about their own deaths and it brought a smile to my face. But, this is a discussion I know many do not have. My grandmother recounted a story of her friend that refuses to talk about his own imminent death with his grandchildren, “because it is too sad.” And I can understand that point of view. Everyone should be able to make their own decision on their level of comfort when it comes to discussing death, but from my personal experience I feel reassured after my discussions with my grandparents. While the thought of losing them breaks my heart, it is also mended by the fact that I know that they are not scared of what death may bring. I am becoming more and more curious as to why these conversations on death cannot be public discussions, as well as private ones. A look at what happens when the rich and famous die. Many of us are familiar with death whether it is someone close to us or a friend of a friend. The deceased is often remembered and mourned for in a relatively private way. However, all the rules seem to be thrown out of the door when the deceased is not the elderly man next door, but a celebrity. An interest in the lifestyles of the rich and famous is something that seems universal across the globe. Their every move is documented, publicized, and largely criticized. Pictures are taken and articles published for tasks as insignificant as grocery shopping or jogging. Celebrities, for some, have reached a god-like status. Their fans are dedicated, passionate, and quick to combat the haters. The life of a celebrity is seemingly not their own. It belongs to the fan, the critic, and the consumer. The same goes for their deaths. The death of a celebrity often prompts more fanfare and acknowledgment than the deaths of millions at the hands of disease and hunger. A celebrity death tends to prompt news specials, award show tributes, and sometimes public displays of distress by people who were merely fans of the individual. The public mourns the celebrity’s ability to inspire, encourage, and provide an escape. The fan is mourning the loss of a connection, a figure that to them was maybe more than a person. An LA Times article referenced the phenomenon saying, “We don’t cry because we knew them, we cry because they helped us know ourselves.” The way we ritualize death often seeks to serve the needs of the living over the needs of the dead. We view death from how it affects us. The death of an ordinary person is made more about those left behind then celebrating the person who is no longer here. The celebrity experiences this to a greater extent. For most it was not the loss of Prince the person that caused tears to roll down their face, but the loss of hundreds of unrecorded songs and the persona of a man who dared to defy the status quo. The connection between the fan and the artist is one that is cherished by many. 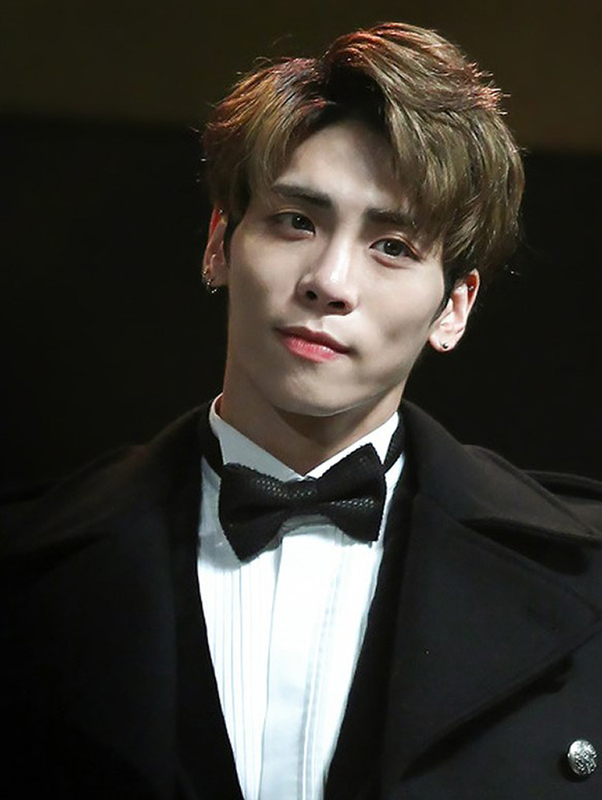 Some celebrities are defined by their deaths as much as their life especially when their death is a “bad” one such as suicide, a drug overdose, or murder. 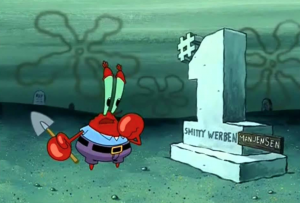 Their legacy, more so than the average person’s, is shaped by this death. Whitney Houston, Michael Jackson, and Prince will always be remembered for their indelible contribution to music. In the same breath their overdose related deaths will forever be tied to their name in the public sphere. It is through the death of a celebrity that we get a glimpse of life in the spotlight. Despite what we learn we cannot help but place their death back under the same spotlight. It seems as if their celebrity demands consumption by the public, even when they are no longer alive. Death is something that is unavoidable. Whether you have experienced the death of a close one or have yet to do so, it is a universal experience. However, it is not experienced in the same way all over the world. In Tana Toraja, located in the Sulewesi highlands of Eastern Indonesia, cultural anthropologist, Kelly Swazey, explores how death is not a singular event in her TedTalk, “Life that doesn’t end with death.” The physical cessation of life is not considered the same thing as death. Instead, the deceased are referred to as “to Makala” (a sick person) or “to mama” (a person who is asleep). These people continue to live with and be members of the household, where they are “symbolically fed and cared for.” It is during this time, that families will begin a series of ritual orders that informs the community that a member of their family is transitioning into the Puya (the afterlife). The deceased member is considered truly dead only when the extended family reaches an agreement and when the family has enough resources to hold a funeral ceremony that is deemed appropriate for the status of the deceased. These funeral ceremonies are lively affairs that can last from a few days to weeks. They are considered the most important social moment in someone’s life, outweighing births and weddings. Through these ceremonies, a reciprocal debt society exists within the community that depends on the number of animals, such as water buffalo, pigs, and chickens, that are given and sacrificed in honor of the deceased. In a way, the sacrifice of the water buffalo and the ritual display of wealth is a way for the family to exhibit the status of the deceased member and by default, the family. These funeral ceremonies are required to take place in front of the entire community and involves everyone’s participation. 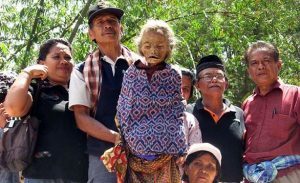 Once a person is deemed physically dead, their body is placed in a special room in the tongkonan (a traditional residence). The tongkonan represents both the family’s identity and the life cycle. The shape of the tongkonan that you are born into is the same structure that brings you to your ancestral resting place. While the Torajans practice ways to live long, healthy lives, they do not put as much effort in prolonging life if they have reached an old age or have a terminal illness. They believe that everyone has a predetermined amount of time to live that is like a thread, and that it should be “allowed to unspool to its natural end” without artificial interruptions. While this funeral practice may be something that is foreign to us, it is familiar in that it is a way for people to come to terms with the death of a loved one. The Torajans recognize that their relationships with other people do not end with the physical death of someone close. They are able to extend their relationship with the deceased by transitioning from a relationship to a living person to a relationship with the deceased as an ancestor. 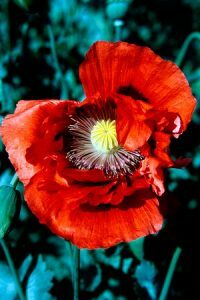 The opium poppy, effortlessly sprouting across several continents, has captured the attention of humankind for thousands of years. Likely due to its sedative effects, the ubiquitous scarlet flower has consistently been associated with death. The Greeks depicted Hypnos and Thanatos, the gods of sleep and death, donning crowns of red poppies. After World War I, millions of people began to line their pockets with the same red petals in remembrance of the fallen soldiers. Today in the US, the flower reminds us an alarming epidemic, claiming thousands of lives each year: the opioid crisis. But before that, another opiate crisis loomed large in a different empire: the Qing dynasty. I have heard that you strictly prohibit opium in your own country, indicating unmistakably that you know how harmful opium is. You do not wish opium to harm your own country, but you choose to bring that harm to other countries such as China. Why? There was no response to the letter. What followed was two opium wars, eventually forcing China to legalize the importation of opium. The effects ultimately derailed the country and toppled the Qing Dynasty. The very mechanism that makes opioid highs so euphoric is also what makes them so deadly: once opioids enter the bloodstream, they bind to receptors in the brain, producing effects that block pain and provide relief, but also slow breathing. Victims of overdose often die from respiratory depression, physically unable to breathe in enough oxygen to keep their organs alive. Perhaps this is why humankind cannot seem to shake its toxic obsession with the opium poppy, century after century being lulled into the sweet calm it provides, only be led into a tortured death by addiction. One thing is for certain: the United States must take urgent action to address the epidemic, lest we see the fall of another empire. “Lin Zexu: Letter to Queen Victoria, 1839.” Longman World History, wps.pearsoncustom.com/wps/media/objects/2427/2486120/chap_assets/documents/doc24_1.html. Maron, Dina Fine. “How Opioids Kill.” Scientific American, 8 Jan. 2018, www.scientificamerican.com/article/how-opioids-kill/. “Opium Throughout History.” PBS, Public Broadcasting Service, www.pbs.org/wgbh/pages/frontline/shows/heroin/etc/history.html. Pletcher, Kenneth. “Opium Wars.” Encyclopædia Britannica, Encyclopædia Britannica, inc., 9 Mar. 2017, www.britannica.com/topic/Opium-Wars. Wee, Sui-lee, and Javier C. Hernandez. “Despite Trumps Pleas, Chinas Online Opioid Bazaar Is Booming.” The New York Times, The New York Times, 8 Nov. 2017, www.nytimes.com/2017/11/08/world/asia/china-opioid-trump.html. This blog is a platform of communication for a college course at Emory entitled "The Anthropology of Death and Burial". The purpose is to use this blog to invite the world into our classroom by drawing on current events or phenomena that surround us and that are relevant to our exploration into the topic of death and how people deal with it. The course is explicitly cross-disciplinary and besides anthropology we also explore the topic of death through the lens of biology, history, religious studies, medicine, law, philosophy, sociology, literature and art. Feel welcome to explore and participate! The contributors to this blog are all undergraduate students at Emory University in Atlanta GA (USA). The course is taught by Dr. Liv Nilsson Stutz who is an archaeologists with a special interest in mortuary archaeology and ritual studies. She is also a regular contributor. Alicia Walker on Do we really want to live forever? Rachel Lee on Cats, Computers, or Doctors: Who’s the best at predicting death?